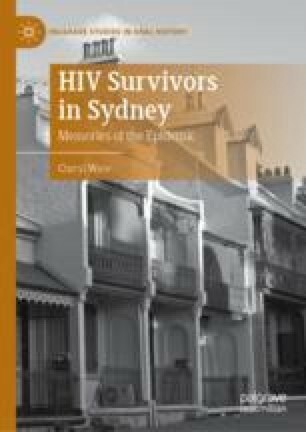 This chapter investigates how HIV-positive gay men dealt with others’ deaths both within and outside of the support networks and public commemorations that activists established. Most of the men who participated in this study composed their narratives to uphold public representations of community solidarity. They depicted themselves as part of a gay community that persevered despite the insurmountable losses they collectively faced. Ware explores narrators’ memories of attending Candlelight Vigils, the use of humour and nightclubs as outlets to cope with their prevailing grief, and the trauma of attending—or avoiding—countless funerals. The chapter offers a much-needed examination of both public and private grieving rituals and the impact of death on those who endured such losses.